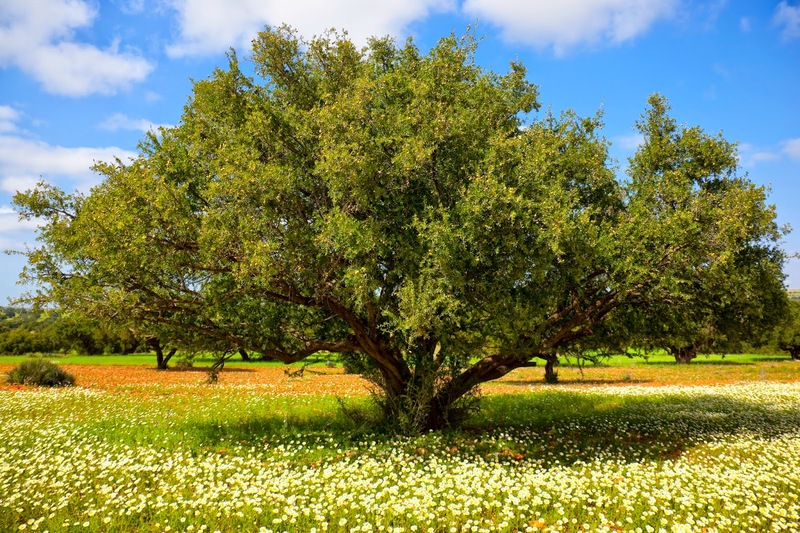 We wanted to discuss the orgins of The Argan Tree and to explain why we choose to build our brand around this amazing oil and the nutrients it provides, which comes from the nut of the Argan Tree. The tree is a relic of the Earth's Tertiary Period and can only be found in Southwestern Morocco now. This gift from nature can grow between 7 to 10 meters high and is believed to be a blessing due to its amazing characteristics. The Argan Tree can live from 150 to 200 years, longer than the olive and requires no cultivation. Should it die, it can lay dormant and revive itself in 7 years. It is tenacious, withering and fruitless during extended droughts; can handle very high temperatures, manages well at preventing erosion due to its strong root system, thus preserving fertility of the soil and definitely is great at dealing with the harshness of the desert. The appearance is often twisted and gnarled, allowing goats to clamber along its branches and feed on the leaves and fruits. Its fruit has a green exterior and reminds you of the olive, but it's large with a hard-shelled nut inside. The goats value this tree and they love to eat the fruit, the fleshy part is digested but the nut remains. These nuts are what the farmers use to extract oil from. In the traditional Berber pharmacy, this noble and rich oil is intended for everyday use - for internal as well as external treatment. It is used also on babies to protect against external influences. Body oiling is also an ancient Indian ayurvedic medical treatment, providing energy to the body and enhancing one's wellbeing. The massage using argan oil, which needs to be gently applied, is considered to be helpful in losing weight, improves the firmness of the skin and relaxes the spine. Argan oil is easily absorbed into the skin, leaving greasy residue on the skin. It is also one of the most important oils for making the skin look younger and is used also for the treatment of various skin diseases. The high content of vitamin E (twice as high as in olive oil) has strong antioxidant properties. Vitamin E is important for the development and maintenance of the functions of the nerve and the muscle systems. Argan oil contains more than 80% mono-and polyunsaturated fatty acids, which have beneficial effects on rheumatic conditions and cardiovascular diseases. Additionally, they neutralize free radicals, protect connective tissues, stimulate oxygen in the body, improve brain capacity and have a beneficial influence on the liver and digestion. The high content of linoleic acid helps to regulate the blood levels of cholesterol. Studies have shown that 16 g (2 table spoons) of argan oil satisfies the body's daily needs for essential linoleic acid, which is said to help to regulate the blood levels of cholesterol. UNESCO, and enthusiasts excited by the oil's reputed anti-aging qualities have helped by creating a global market for the exotic oil, the unlikely alliance hopes to raise awareness about the inherent value of the trees, encouraging more careful grazing and stopping the local population from chopping the trees down for firewood. The people in the area are poor; as they now understand the value of the tree, they are protecting it. It has declared a 25,900-square-kilometer of land (between the Atlantic and the Atlas Mountains) an Argan reserve and provided money to manage the trees' preservation. Chefs and society matrons took up the cause, praising the culinary qualities of the oil and its anti-aging effect on the skin. There is also a ban against grazing in the trees from May to August, when the fruit ripens to a bright yellow and eventually the goats climb the trees, eat the fruit and expel the pits, which locals continue to collect. At the Cooperative in Tiout, Berber women sit on the floor with rough rectangular stones between their knees cracking pits with rounded rocks. Each smooth pit contains one to three kernels, which look like sliced almonds and are rich in oil. The kernels are then removed and gently roasted. This roasting accounts for part of the oil's distinctive, nutty flavor. It takes several days and about 32 kilograms of fruit, roughly one season's produce from a single tree, to make only one liter of oil. The cosmetic industry love’s that it’s rich in vitamin E and essential fatty acids and is used for massage, facials and as an ingredient in anti-aging cream. The edible oil is extracted from roasted kernels. Most of the oil is bottled pure for cooking, as a dressing on salads, meat or fish or simply as a dip for bread. The Tiout cooperative produces about 5,000 250-ml bottles of the edible oil a year. Sustaining Communities and Supporting Women of Morocco through the Berber Women Cooperatives: All argan sold today is produced by a women's cooperative that shares the profits among the local women of the Berber tribe. The cooperative has established an ecosystem reforestation project so that the supply of argan oil will not run out and the income that is currently supporting the women will not disappear. The money is providing health care and education to the local women, and supporting the entire community as a whole. According to the Department of Water and Forests, Argan oil provides income for 3 million people in the southern part of the kingdom. The oil provides a total of 20 million workdays per year. Its operation is an income-generating activity and has always had a socio-economic benefit. The vast majority of the production of argan oil passes through the women's cooperative of Argan oil. This program focuses on improving the working conditions of rural women’s economic activities, generating additional income and sustainable management of argan areas in the southwest of Morocco. Co-sponsored by the Social Development Agency (SDA) with the support of the European Union, the UCFA (Union des Cooperatives des Femmes de l’Arganeraie) is the largest union of cooperatives for argan in Morocco. It comprises twenty-two cooperatives that are found everywhere in the region (e.g., Coopérative Al Amal, Coopérative Amalou N'Touyag, Coopérative Tissaliwine, Coopérative ArganSense, Coopérative Maouriga). These women come together to be better organized and thus guarantee a fair income through cooperatives, allowing them a better living environment and a dynamic local. Women cooperatives in Morocco work within a biosphere protected by UNESCO, which ensures its protection and reforestation. Now increasingly important for oil produced for sale, as the oil will keep 12–18 months and extraction is much faster. Using mechanical presses, mixing of the dough and water is unnecessary and the dough can be directly pressed. All other steps remaining unchanged, the oil is obtained in about 43% yield (calculated from the kernels) and only two hours are needed to get one liter of oil that preserves correctly. "Biosphere Reserve Information". UNESCO. Retrieved 2007-10-11. Pharmaceutical Society of Great Britain (1880). The Pharmaceutical journal. J. Churchill. "Argan Oil Ailment Treatment". DietOBio. Retrieved 2006-10-09. "Is Argan oil miraculous?". Care2. Retrieved 2009-07-17. These statements have not been evaluated by the Food and Drug Administration. This information is for educational purposes only, and is not intended to diagnose, treat, cure or prevent any disease. If you are pregnant, nursing, taking medication, or have a medical condition, consult your physician before using this product.